Too often, clients with substance abuse and addiction problems achieve sobriety only to relapse shortly after. As a clinician in the addiction treatment field, you are undoubtedly familiar with this common scenario, and it can be a source of extreme frustration. To make matters worse, clients may see their relapse as evidence of personal failure and inadequacy, and as a result, they may resist more treatment. What if you could break this cycle and help clients maintain their progress? 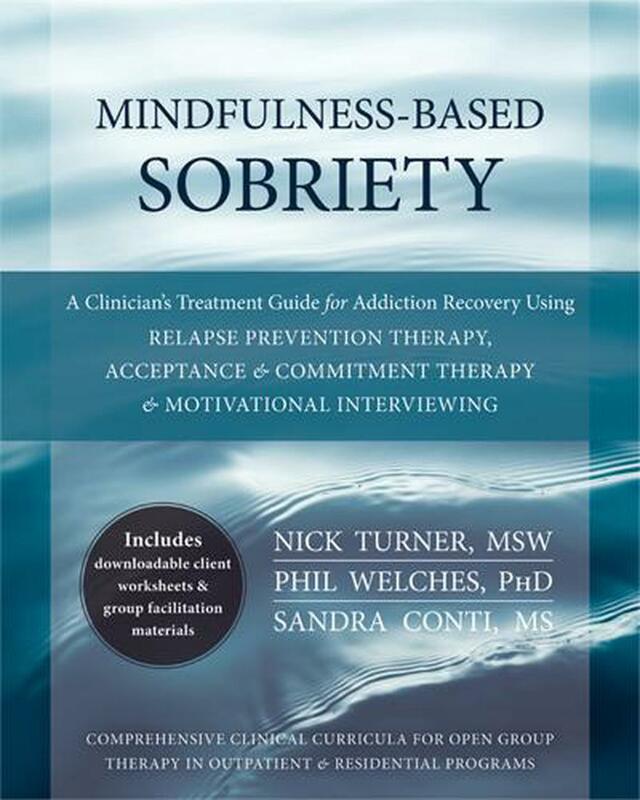 Mindfulness-Based Sobriety presents a breakthrough, integrative approach to addiction recovery to help you treat clients recovering from substance abuse and addiction using mindfulness-based therapy, motivational interviewing, and relapse prevention therapy. Research has indicated that mindfulness-based therapy is highly effective in treating emotion dysregulation, stress, depression, and grief--all emotions that lie at the root of addiction. Motivational interviewing is helpful in treating addiction because it helps clients learn to change the behaviors that cause addiction. And finally, relapse prevention therapy teaches individuals with addiction to anticipate and cope with potential relapse. This book combines all three of these highly effective treatments. This powerful manual was developed by Gateway Foundation clinicians in order to better fulfill the mission of reducing substance abuse and co-occurring mental health problems. The book provides two curricula: an outpatient treatment curriculum and a residential treatment curriculum. Both are user-friendly and can be implemented in an open group format, which means that you can say goodbye to the days of tailoring one-on-one treatment to fit a group setting. The integrative approach outlined in this book will help your clients conquer substance abuse by identifying their own values, strengthening their motivation, and tackling other mental health problems that may lie at the root of their addiction. Furthermore, the book's strong emphasis on relapse prevention means that you can help clients stay on the path to sobriety. Nick Turner, MSW, received his master of arts degree in social work from the University of Chicago's School of Social Service Administration. He has worked in various mental health and substance abuse settings with children, adolescents, and adults. Turner is currently working in the Road Home Program at the Center for Veterans and Their Families at the Rush University Medical Center in Chicago, IL. He is also an adjunct faculty member at the University of Chicago. Turner is a licensed clinical social worker (LCSW), certified alcohol and drug counselor (CADC), and a member of the Association for Contextual Behavioral Science and the Motivational Interviewing Network of Trainers. Phil Welches, PhD, is a clinical psychologist in Chicago, where he maintains a private practice in psychotherapy and consultation. He is past clinical director for Gateway Foundation's community services division, past director of psychology at Chicago-Read Mental Health Center, and past director of two non-profit addiction treatment centers. He is a member of the Motivational Interviewing Network of Trainers (MINT) and president of the Association for Contextual Behavioral Science (ACBS) Chicago Chapter. Welches has published several articles in peer-reviewed journals on collaborative research, assessment, and therapy. Sandra Conti, MS, received her master's degree in clinical psychology from Benedictine University. Conti is currently working with Guided Path Psychological Services in Palatine, IL, where she specializes in providing individual and group counseling for clients with substance abuse problems and mental health needs. Conti is a licensed clinical professional counselor and is a Zen student under Marsha Linehan Roshi, PhD. Previously, Conti received a masters of business administration from Benedictine and worked in the financial field. In addition, she was formerly a substance abuse counselor at Gateway Foundation's Aurora, IL, site.